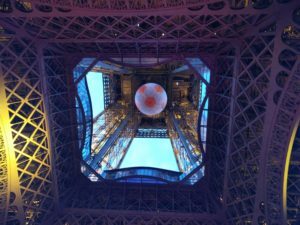 This is very long post about my longest trip to WordCamp + Europe. We took early morning flight from Pune to Paris via Delhi. We had 3 hours layover in Delhi. 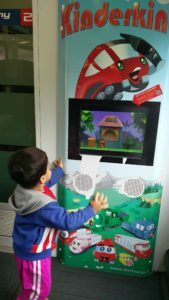 Raj spent most of this time playing in kid zone at Delhi Airport. His favorite was helicopter! In flight, Raj spent most of this time sleeping. In Delhi-Paris flight I was fortunate to meet Shirish Srivastava, associate professor at HEC Paris. My discussion with them was very interesting. They also guided me about Paris. Their suggestion to use Big Bus was very helpful. We landed in Paris around 6pm. Paris airport was not crowded. I am not sure it I was just lucky or it was effect of previous week’s flood. Immigration did not took any time. No questions asked! Only thing took time was arrival of our luggage. I had already booked a post-paid taxi via shuttle-inter.com. It did not took much time to locate taxi and get going at arrival. But behaviour of driver was disappointing.So I won’t recommend this service to anyone. You can read my review of Shuttle Inter service on Yelp. After unpacking and small break, we took a walk to Eiffel Tower. It was less than 500m away from our accommodation. In fact it was visible from our kitchen. It started to get dark when we reached there, so it was illuminated. I think Eiffel Tower looks better when it’s illuminated. As day was about to end, we did not go up and just came back after clicking some pics. Expecting a lot bigger queue, we reached 30 minutes earlier. I missed booking online ticket which is a very good option. The queue was smaller than expected. When we came down in afternoon there was no queue. 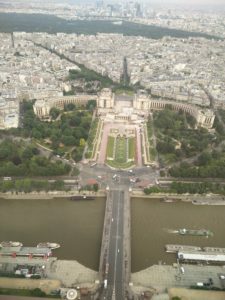 The thing I enjoyed most at Eiffel Tower was going up by lift till the top! The view from top is really good although. Eiffel Tower has many restaurants and shops at each level. I did not know this before I started planning my trip. 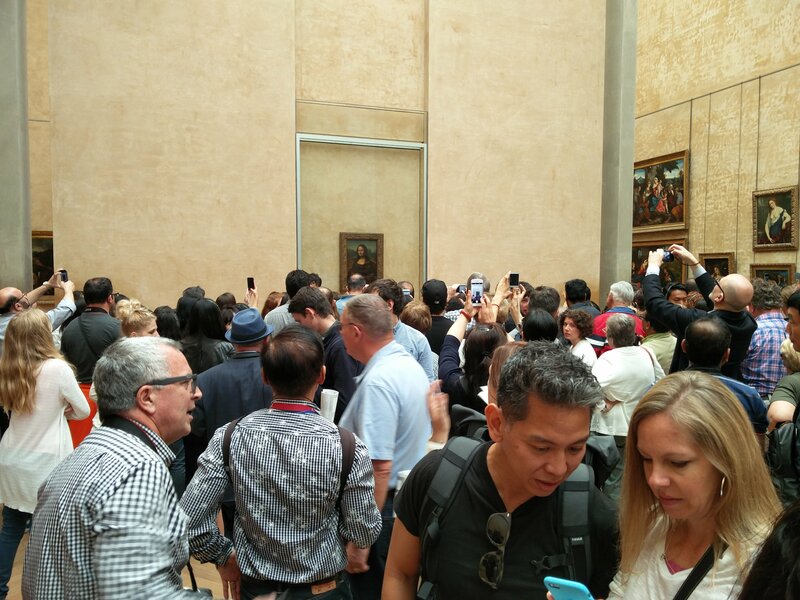 The main (read only) attraction for my visit to Louvre Museum was Mona Lisa Painting. I did not find it much appealing. I realised that painting looks same in real as they look in pictures! The painting is very small itself and people were flocking to click picture of picture (painting). I did not understand the craze so I clicked a picture of people who were taking picture of painting. It matches what we saw in meme some time ago! From there, we came back to our accommodation for break. I booked a Big Bus tour for next day. After that we went out to get a local SIM and dinner. The mobile store guy made default language French which made my life hard using Lycamobile. I tried contacting Lycamobile customer care for help but nobody picked up the call after repeated attempt. Similar thing happened in Vienna where I received German language from Lycamobile and could not reach customer care. For dinner, we visited Royal Rajasthan, an Indian restaurant whose owner was very rude. So we left without eating. There was a Subway outlet nearby. Subway staff was very nice. They did not understand English but still helped Rajshree make a vegetarian sandwich. I was glad to see Subway had vegetarian options in Europe. At McDonalds and Burger King, veg burger comes with Egg. They even label Tuna fish also as vegetarians! Today we took Big Bus tour. I liked this hop-on hop-off bus tour concept. We first did a complete round trip. The we visited Champs-Élysées which is famous for shopping. We had lunch at Annapurna, an Indian restaurant. It was OK. You can read my review about it on Yelp. After that we went for river cruise on Seine river. It was below expectation. The river was smelling bad. Also, they needed to change the route because of the flood, so some part of the trip was cut off. Of course, the person at ticket counter informed about this before buying ticket. So no issue about route change. But may be with original route, it would have been better. 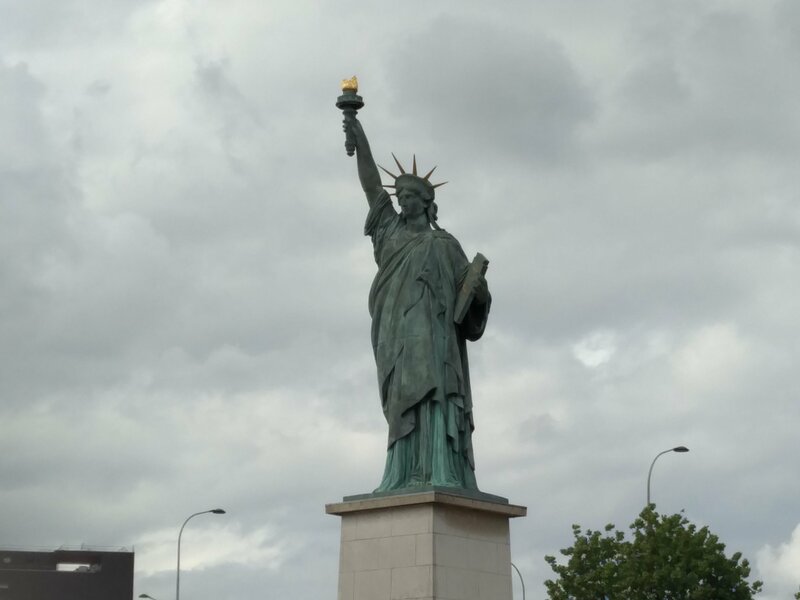 During boat ride we came across Statue of Liberty! I knew that the original Statue of Liberty was gift to United States from France. What I did not know that French kept a copy of it for themselves! When I googled for more details, it turned out that there are many copies and Wikipedia has a page dedicated to it. We left early morning to catch TGV train to Basel. I was excited about this as I read a lot about TGV trains speed. We used Uber to go to Gare De Lyon train station. Uber was having almost 3x surge pricing. Even worse, 3 Uber drivers cancelled ride after accepting it, most likely because of road barricades. It created some tension as we did not account for such delay. Finally a driver came. He seemed familiar with area as he took different route than what Uber app was suggesting. He was a nice and helpful guy. I wonder why Uber drivers in India are so bad. I did not had a single bad experience with Uber in France, Austria and even in US for my past trips! In Switzerland, I did not used Uber as public transport is too good. What happened next was quite scary. A security officer came and spoke in my ear to move to some other area. They found an abandoned bag so they were moving away all passengers. By now, I understood why that area was empty. It was scary to see the bag we has talking about was right next to me! ? I moved quickly to some distance. In fact imaging worse, I moved on the other side of a partition wall. Next 30 minutes, I was just observing the situation. I admire the calmness which with the main officer was moving away people approaching that area without creating a panic scene. After 30 minutes, a man came to claim that abandoned bag. That idiot went for toilet leaving his bag unattended. I thought the idiot would have hard time now but officer let him go with warning! We boarded train with some happy memories. The Paris is indeed a beautiful city but it is almost a sin to speak English their. Also as I take less interest in arts, sculptures and architecture, there was not much to do for us. Apart from that, we were seriously warned a lot about safety concerns in Paris by friends, relatives and even strangers we met at airports & flights. Overall, Rajshree doesn’t want to visit Paris again. 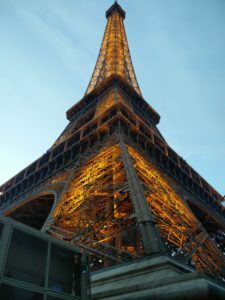 For me, I will visit Paris again for WordCamp Europe 2017. But it is not a city I would consider for my vacation. TGV train from Paris dropped us at Basel. From there our Swiss Travel Pass came into effect. As we purchased it online, we did not need to validate it offline at ticker counters. So we just boarded train to Luzern. 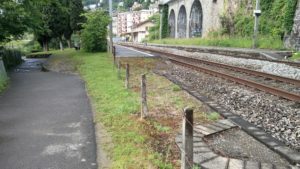 In Luzern, we had another AirBnB booking, quite close to the station. We took a walk to our accommodation but I was not able to find exact building. May be offline Google Maps was not as accurate as online one. So I called our host Jochen for help but instead of guiding, he came down to pick us. After some unpacking, we went to nearby supermarket and loaded water and other groceries. We were here for a weeklong stay! Then we took a walk to Chapel Bridge in Luzern. From Luzern station, I took a local SIM as Lycamobile’s international roaming did not work as per their advertisement on their own website. The shopkeeper Mohammed from Sri Lanka suggested me Lebara. I was happy with Lebara as it worked nice for data and free calling back to India. For dinner, we tried Tidbits. Tidbits is a pure vegetarian restaurant but not for Indian food. 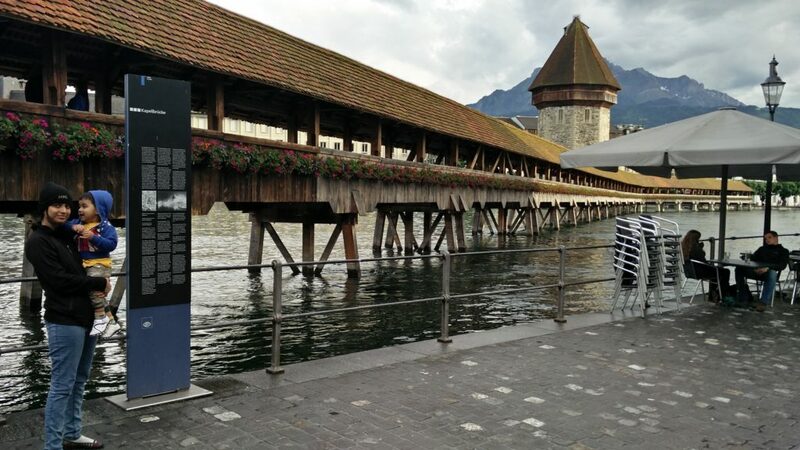 I find it ok. As it’s right at Luzern station, may be you can visit it on your next trip. You may read my review on Yelp. We wanted to visit Mt. 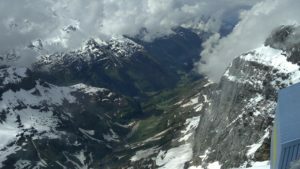 Pilatus and Mt. 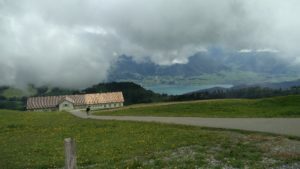 Rigi today but it was cloudy and drizzling. 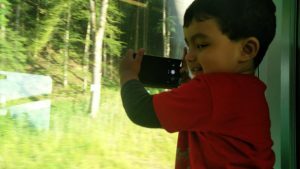 So we took Pre-Alpine Express to St. Gallen. On way we enjoyed beautiful Luzern Lake and scenic mountains from train. From St. Gallen we went to Rhine Falls. I purchased Rhine Falls ticket which was not needed for Swiss Travel Pass holder. They did not have boards which inform about this. So if you are travelling with Swiss Travel Pass, at any place where you need to buy such ticket, tell them you have Swiss Travel Pass. They may give you free tickets! I got free tickets at many. But it would have been better if they put some banners or notices about it. At Rhine Falls, they have many observatories from where you can see it closely. So close that you can experience speed at which water is flowing! 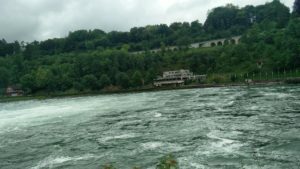 Rhine Falls is famous for flow rate rather than height. We crossed Rhine Falls and went to other end by boat. 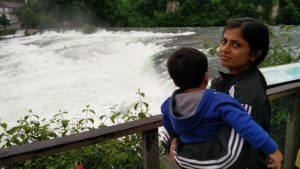 We spent most time walking around Rhine Falls. From there we went back to Luzern, this time via Zurich. We were supposed to change at Zurich HB (main station). I saw on SBB mobile app that next train we needed to catch usually run full, but the train itself originates from few stop earlier. Luckily those earlier stations were common to our Rhine Fall-Zurich route. So we deboarded at earlier stop and secured a place for us. When the train reached Zurich HB, I realised that when SBB app means busy train, it is still nearly 20% empty! So after that point, I stopped bothering about occupancy estimates for train. Our day started with trip to Mt Pilatus. 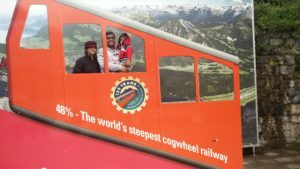 We went up via Alpnachstad in Cogwheel Train. It is steepest Cogwheel train with max 48% incline. It climbed that big mountain in 15-20 minutes. It was a very nice experience and first of it’s kind. I wondered why we don’t have such cogwheel trains in India. Might be useful at places such as Vaishno Devi. 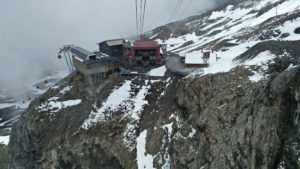 After spending some time on Pilatus, we came down to Kriens using Cable Car and Gandola. We were the only one in Cabel car and Gandola. 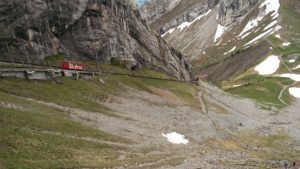 The route we followed for Mt Pilatus is described here in details. After reaching Kriens, we took 10 mins walk to a bus stop. From there we went to Luzern main station. We reached on time and managed to get on a boat sailing to Vitznau. From there we took a cogwheel train up to Rigi Kulm and further walk to the top. We were planning to eat at the top but only place we found had it’s kitchen closed. It was 4pm. Switzerland has some labor laws because of which most places usually closes quite early. On way back, we took different cogwheel train and reached Arth-Goldau. After 10 minutes of walk, we reached to Arth-Goldau train station and form where took a train to Luzern. The route we followed is called “Majestic Round Trip” and details are here. With two mountains in a day, we only wanted to get back home and relax. We left early in morning for Engelberg. The train was full of Indian tourists. 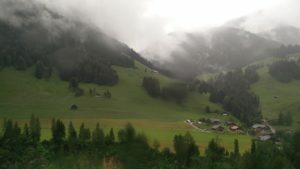 After reaching Engelberg we took a walk to valley station. 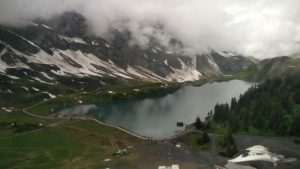 From there it was Gondola and Cable Car ride to reach Mt Titlis. 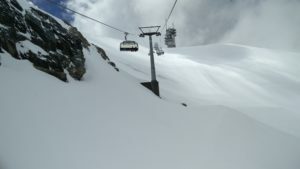 At Mt Titlis, I went for ice-flyer chairlift ride. 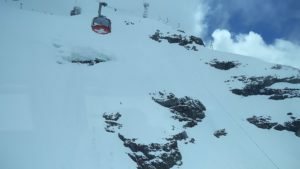 Mt Titlis has way too many Indian tourists. 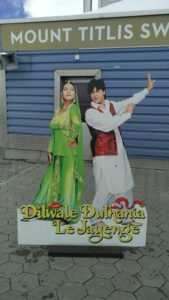 It is so famous with Indians that they have Indian restaurants, even a Shahrukh-Kajol cutout from DDLJ and Hindi translations for some labels. DDLJ cutout with whom people were posing. I needed to stop the queue to get cutout’s photo alone. 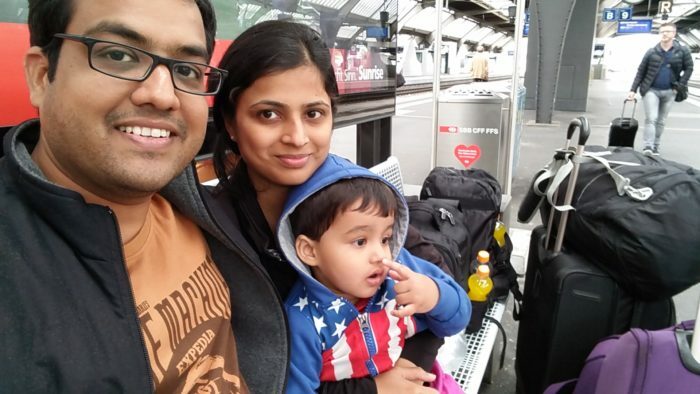 As today we already had plans to have lunch at cheese factory in Engelberg, we skipped Indian restaurants. We couldn’t spend much time on Mt. Titlis as it was full of snow and neither of us was carrying sunglasses! So we came down soon via same route and took a long walk (15-20 mins) to this cheese factory in Engelberg. At cheese factory we enjoyed Fondue and Raclette for lunch. I tried Fondue before but Raclette was new for me. I liked Raclette more. 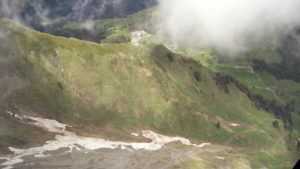 My earlier plan was to visit Mt Stanserhorn on way back and have dinner at revolving restaurant. But we were tired and lunch made us feel sleepy. Also, we had enough of mountains by now so we simply went back to our accommodation. Today we started very early as we wanted to do complete Golden Pass Route which alone takes more than 5 hours, one-side. 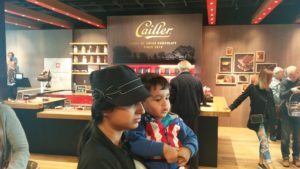 In last phase of Golden Pass, we deboarded at Montbovon and took a detour for Cailier Chocolate Factory. 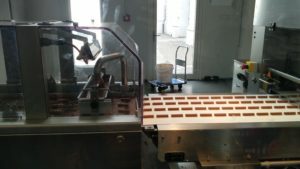 The visit to Chocolate Factory was a very nice decision. This was the only place which we found to be overcrowded. May be it was Sunday effect. We needed to wait almost 1.5 hours before getting a chance to get in. But it was completely worth the wait. The factory had a cafe where we had some snacks while waiting. 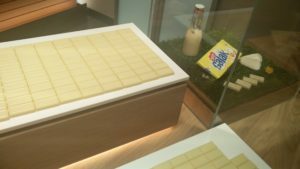 The tour started with animated history of chocolate, then actual process of chocolate making, followed by chocolate tasting. I don’t like chocolates much but I couldn’t resist testing freshly made chocolates. 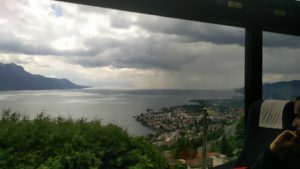 From there we went to Montreux. It is French-speaking part of Switzerland and like France I came across “beware of pickpocketers” warning signs. The road in front of Montreux train station was closed for buses. We asked few people about direction but we did not get required help. After wasting 30 minutes, we went back to Montreux train station and reached Chillon Castle by train. The walk from train station to the castle was one of the most beautiful walk I ever had. 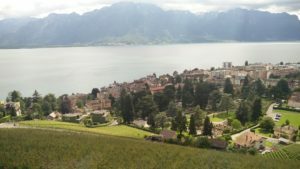 From castle, we took a train to Lausanne and from their to Luzern. On way back we had option to visit Bern but we were too tired for it. I feel most scenic part of Golden Pass route comes between Montbovon and Montreux. In fact any route in Switzerland is scenic. We had option to reach chocolate factory in 2-hours via shorter route. So on next trip, I will not spend extra hours talking longer route for a destination. 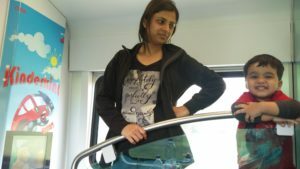 Of course, if you have time, just roam around in Swiss trains. The person who said, “The journey is the reward”, might have traveled a lot around in Swizterland. Many times we just took trains but did not explore destination! My original plan was to take Glacier Express route today from Chug to Brig. It would have another long day with almost 10-hours in train. On way back, we would have visited Bern. But instead of that we decide to shop for Swiss watches and cow bells. 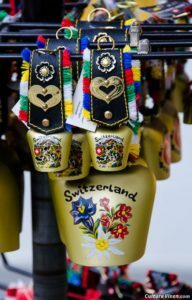 Swiss cow bells are quite famous in India because of movie DDLJ. Sometimes I wonder how much impact a movie can make on tourism! Till now, we did not have Indian food in Switzerland. 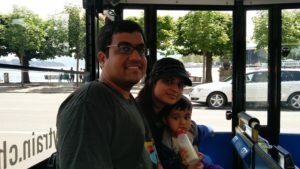 As Rajshree loves South Indian food, we went to Kanchi, a restaurant I found on Yelp. This restaurant was so amazing that I regretted having heavy breakfast. You can read my review of Kanchi on yelp. After breakfast, we explored market, did some shopping and had some street side food. 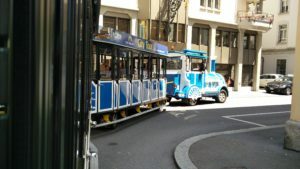 We also took a toy train ride for Luzern city tour. The train had hindi audio guide with funny Hyderabadi accent. It was so funny that I kept listening in Hindi. After shopping, we went back to our accommodation to drop all stuff and then went to Zurich for more shopping and dinner. In Zurich, as we had less time, we explored only Bahnhofstrasse (shopping street). We also boarded a random trum and tried to explore city. 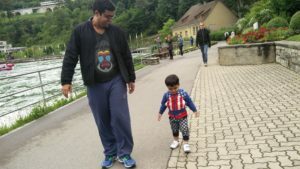 With Swiss Travel Pass such unplanned activity becomes very easy. We had a dinner at another Indian restaurants in Zurich called Thali and it was nice again. We must have bene lucky today! I also reviewed Thali on Yelp. We returned to Luzern earlier as we wanted to pack as much possible for Vienna trip starting tomorrow. We left early morning to Zurich from there we had Railjet train to Vienna. It was 7.5 hours journey from Zurich to Vienna. Railjet train was almost empty, had free wifi for me and kids zone for Raj. 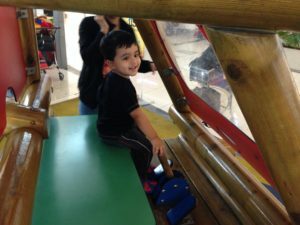 Their online seat reservation system helped me pick seat next to kids zone. 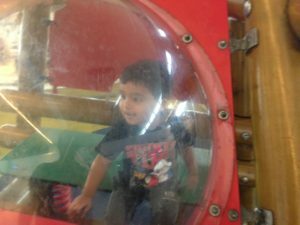 Raj spent most of his time playing in kids area. The journey was scenic like most European train journeys. In evening we reached Vienna. It was easy to get out of Vienna main railway station. We called Uber and driver picked us from correct spot without a glitch. This is rare considering we were picked from a main railway station without fixed spot. In Vienna, I already booked a hotel called NH Wien City well in advance. I won’t recommend this. You can read my review on tripadvisor. As we wanted to attend WordCamp Europe, I felt hotel might be better option from safety point of view compared to AirBnB accommodation. 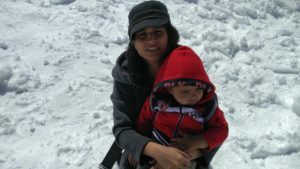 It turned out to be right decision as Rajshree could not to attend full WordCamp with Raj, on both days. Also, Vienna was unexpectedly hot and the hotel has air conditioning. I could not imagine sleeping without air conditioning in so hot weather! I heard from other attendees that most AirBnB options did not have air conditioning. By the time we settled in bed it was already 10pm. As Rajshree was hungry, I went out to get some food from nearby McDonalds. Only vegetarian item they had was salad! We had no agenda for 2-extra days we had before WordCamp. But I liked Big Bus concept so first thing I looked for was Big Bus again in Vienna. As they had no online booking discount a day earlier, I decided to buy ticket from a nearby stop. When I reached bus stop, I found another alternative similar service called Vienna Sightseeing. On first bus itself, we found a front-row empty seat on upper deck. In 10 minutes we realised why it was empty! The weather was so hot that only few people were sitting people on the upper deck. Front row being was suffocating with no ventilation and air conditioning. ? As weather was unbearable, we just viewed Vienna from Bus! The only place we hop off was a Pakistani restaurant for lunch. This restaurant felt like home. The food, people and atmosphere everything was amazing. When it came to billing, the owner simply said – “Pay as you wish!”. This was a shocker. I found it was hard to decide how much to pay as I have no idea of costs involved in Vienna. If you are visiting Vienna, you should visit Der Wiener Deewan on your next trip. I personally do not prefer to eat Indian food when traveling. In fact, I prefer completely local food! But if I visit Vienna again, I will likely pay a visit to this place again even if I am alone! You can read my review of Deewan on Yelp. The bus tour package we opted for has a Danube boat tour included. We had option of choosing green-ride or urban-ride. We choose green ride. The green ride was not as beautiful we hoped. May be it was raw forest and we were hoping for beautiful landscapes that we saw in Switzerland! The highlight of the trip was passing through a river lock! I saw it very closely in amazement. Our boat was first to reach lock so I had very good view. Unfortunately, I could not shot a video which can entire experience nicely but following video of similar experience may give you an idea. In our case, we were going up before lock was opened. I think it is more exciting to see a large boat going up with water. As we were last to onboard this boat, we had to sit in boat restaurant. This turned out to be nice as weather was still hot and restaurant had air conditioning. We also had some snacks in restaurant. The staff was nice and could speak some English, so I ended up tasting different beers. ?? One thing I noticed in Vienna was that when you order beer, the beer comes in a glass with beer name. So you know which beer you are having! This is nice as I could order different beer each time. After boat tour, we wanted to join WCEU Picnic organised by Francesca and Naoko. But it was still hot, so we took a different line of bus tour and then went to Deewan restaurant for lunch again. From their we went to MuseumsQuartier which was venue for WordCamp Europe 2016. Pre-registrations were going on. I was glad that we did went for early registration as next days registration queues were long. From their we went to our hotel to get ready for WordCamp Europe Warm up Evening. At this point WordCamp Europe started for us and covered in separate post. 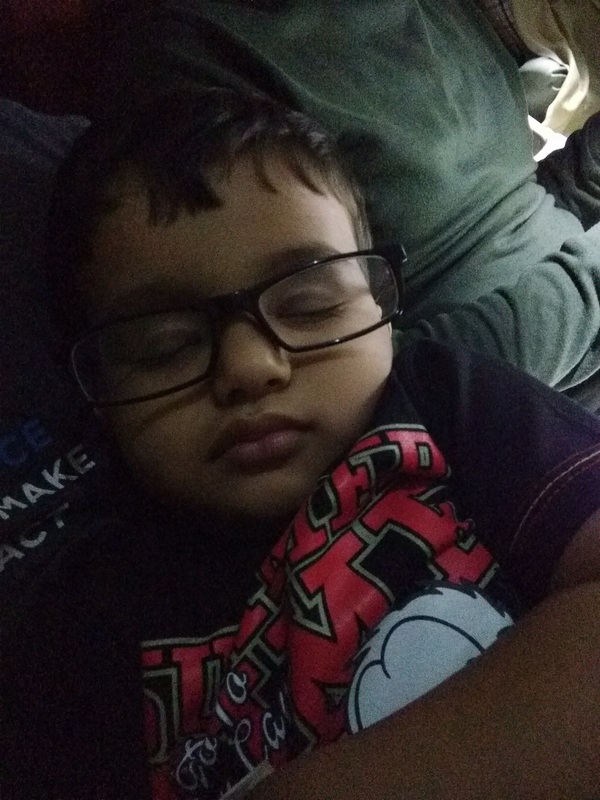 When we went back to Hotel to get some rest before event, Raj fell asleep. So Rajshree stayed back and I went to Warm Up event alone. I know many people from community but I did not see any one of them. Instead I ended up meeting many new people and we talked a lot about non-technical things. It was very good evening with a lot of cultural exchange. I wish I could have taken pictures with awesome people I met. When I checked time it was already 10:30pm so I rushed back to the hotel as I had to pick up some food for my family on the way. The first thing we noticed in the morning was long registration queues. But as we had registration done previous day, we had nothing to worry. I attended opening remarks, Mike Little’s talk and business panel discussion. I liked part where remote working was discussed. My takeaway was, for most companies either “remote work” or “work from office” works. Problem occurs when both cultures are mixed. I think that is where we went wrong when we introduced “work from home” at rtCamp. There may be some companies doing both but the ones I talked to admitted that mixing creates problem. WordCamp Europe had many networking activities such as unconference, speed networking and tribe meetups. I participated more in them and met many new people. I applied for unconference talk also but I could not make the cut. I spend most time meeting new people and catching up with old friends. In my case, at 13, I haven’t seen a computer! At the end of the day, I went to TinyMCE meetup. It turned out to be much better. I talked to TinyMCE founder Joakim Lindkvist about technical feasibility of an idea that we prototyped last year at rtCamp. It was great to get first-hand inputs for such things from the makers of TinyMCE. On second day also, I spend more time in tribe meetups and networking. In afternoon Raj had some fever so I went back to the hotel to drop Raj and Rajshree. We packed lunch on the way and had lunch. 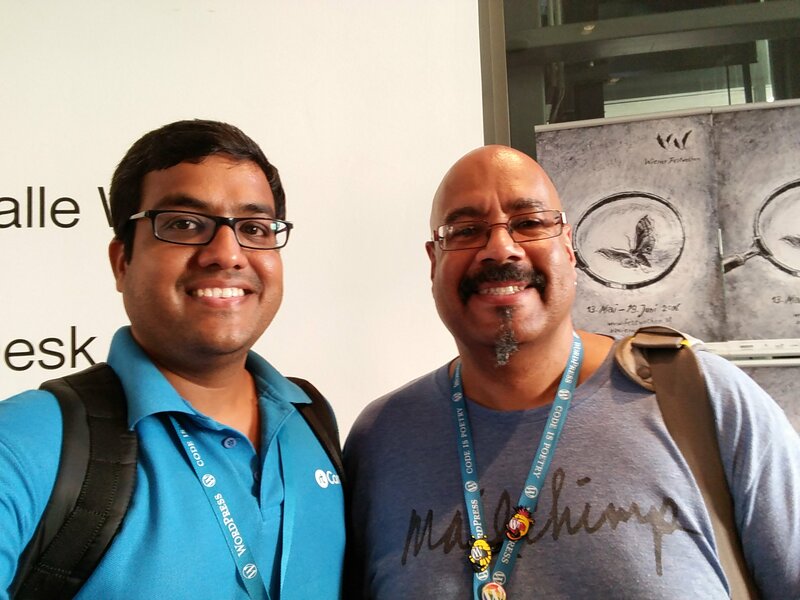 After lunch, I came back to WordCamp where I met Topher and Sunny Ratilal. Sunny is just 19 years old and already developing on WordPress from 6 years. On top of it, he is working with Pippin which itself speaks about quality work he must be doing. After that, I attended talk by Daniel Bachhuber. His talk “My condolences, you’re now the maintainer of a popular open source project“ was related to pain I am going though maintaining EasyEngine project. After his session we talked a lot about future direction of WP CLI project. After that, I met Mike Little again. I forgot to click a picture with him yesterday! After event ended, I went to XWP party. At party, my US speeding ticket came again. Considering attention that incident continues to receive, I think I should stop feeling bad about it! As today was our last day in Vienna, we could only attend half contributors day. I was originally planning to attend community discussion but ended up attending plugin review team. It was nice to know how plugin review team works from Mika Epstein herself. I also met Brian Krogsgard from Post Status. He is the guy to blame if I am not following your WordPress blog. His newsletter covers WordPress ecosystem so nicely that I stop following blogs. I don’t remember when was last time I used Feedly! After having lunch at the venue, we went to hotel to complete checkout and head back to Vienna airport. As always, even after such a long event, I could not meet all people I wanted to meet. I hope someday we will have a weeklong WordCamp! ? I really like to thank WordCamp Europe organisers for putting a lot of efforts in making networking easy. I think networking is often under-rated at conferences when compared to speaker sessions. I am excited to meet most people again at WordCamp Europe 2017. I hope next year I will taste French wine which I missed this time! ? I have covered a lot about my entire trip above. It’s beautiful. Paris and Vienna are alike in terms of museum and arts. Switzerland is full of scenic landscapes. 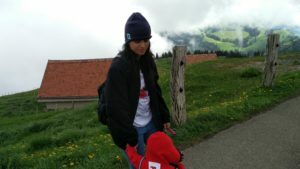 Switzerland is so beautiful that we want to go there again and again. As countries are small, it’s easy to travel to from one country. I love this schengen visa thing. Language is a problem. Even at big supermarkets, most grocery items do not have English labels and staff do not understand English. In fact I ended up picking soda for my little son when I wanted to pick water! In Switzerland, they had labels in 3 non-English languages. 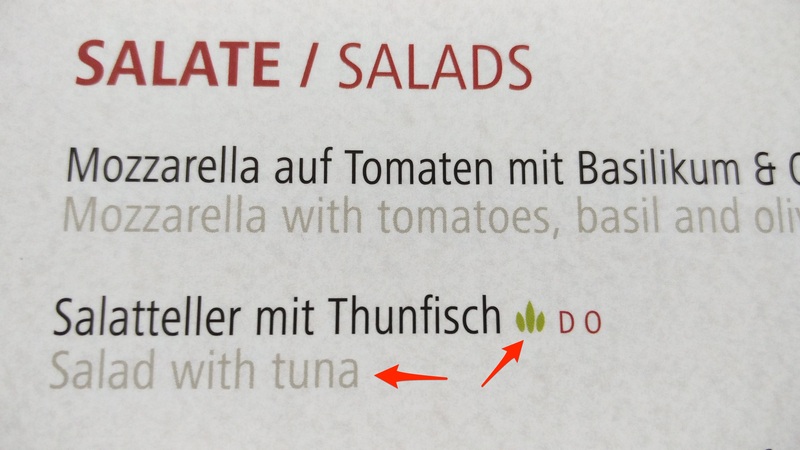 So I had more trouble using Google Translate as I was not sure if I was translating form German, French or Italian. But this helped me understand importance of translation. Mobile Data. Moving from one country to another country, I needed to buy SIM again. I purchased separate SIM in every county. Not only it wasted time but also caused inconvenience. Overall, it was great family trip. I got to spend so much time with my son that I don’t get otherwise. ? ? May I know if embassy for your schengen visa is in Pune itself or you had to go to Mumbai? Pune does not have embassy but you can submit forms via VFS application center located at Soharab Hall. No need to go to Mumbai. It was fantastic meeting you in Vienna, Rahul. I hope we can meet again soon. 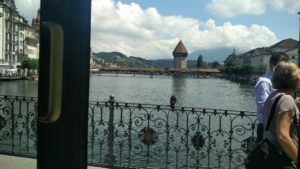 I just love Lucern – that’s the sort of city I could live in! How amazing are the views from Mt Pilatus! Yep. Hope to meet soon. May be WordCamp US. I am glad we stayed at Luzern. It’s not only beautiful but very well connected with entire Switzerland. I was wondering why people use cars there as public transportation is too good! Enjoyed reading this detailed post, the other day but was lazy to comment. I enjoyed while reading as if I was with you. Great photos, especially of Raj. 🙂 I didn’t know it was him in WCMumbai, with the rtcamp tee. 😀 Great leedle rtcamper! 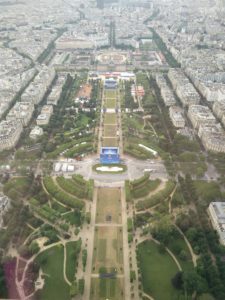 Would you read Kevin’s blog post about WCEU? I wanted to connect the two of you, but was a little late. I will check Kevin’s post and hope to meet at some WordCamp. I will be attending many WordCamps. Appreciated understanding this point by point post, a few days ago however was apathetic to remark. I delighted in while perusing as though I was with you. Extraordinary photographs, particularly of Raj. ? 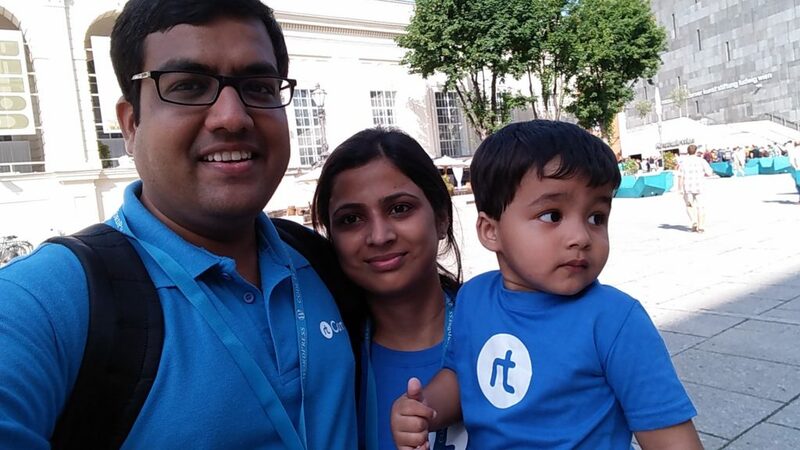 I didn’t have any acquaintance with it was him in WCMumbai, with the rtcamp tee. ? Great leedle rtcamper!